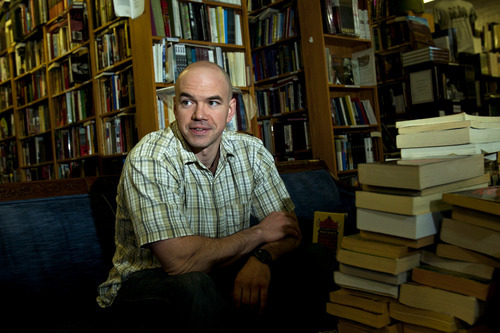 Chris Detrick | The Salt Lake Tribune Tim DeChristopher works at Ken Sanders Rare Books Tuesday April 23, 2013. DeChristopher was released just Sunday from his 21-month term for fraudulently bidding on public land leases at a 2008 Bureau of Land Management oil and gas auction. He had hoped to prevent drilling on sensitive land. Utah activist Tim DeChristopher is scheduled to be a guest on the Late Show with David Letterman (10:35 p.m., CBS/Ch. 2).DeChristopher is the subject of the documentary "Bidder 70," which recounts how he bid in a BLM oil and gas lease auction to prevent oil and gas companies from getting access to the land. He eventually spent almost two years in prison after being convicted of crimes related to his fraudulent bids.I&apos;m guessing Letterman will be on DeChristopher&apos;s side.Elsewhere on TV ...Extreme Weight Loss (7 p.m., ABC/Ch. 4): A 410-pound man tries to lose weight.America&apos;s Got Talent (7 p.m., NBC/Ch. 5): Auditions continue.So You Think You Can Dance (7 p.m., Fox/Ch. 13): The top 20 finalists - including Utahn Jenna Johnson - perform.Rizzoli & Isles (7 and 9 p.m. TNT): In the season premiere, Lt. Col. Casey Jones reveals some shocking news.Perception (8 and 10 p.m., TNT): In the season premiere, Pierce to determine the mental competency of a man being retried for murder.Pretty Little Liars (9 p.m., ABC Family): Hanna tries to protect her mother.Frontline (9 p.m., PBS/Ch. 7): A report on migrant women who are the subjects of sexual assault.Twisted (10 p.m., ABC Family): Kyle tries to incriminate Danny.